YHA’s brand new flagship Youth Hostel in Northumberland National Park is now taking bookings. YHA The Sill at Hadrian’s Wall will provide accommodation for 86 guests across 26 bedrooms, 19 of which are en-suite and two which are fully accessible. The Youth Hostel also features a restaurant and bar as well as a fully-equipped self-catering kitchen. 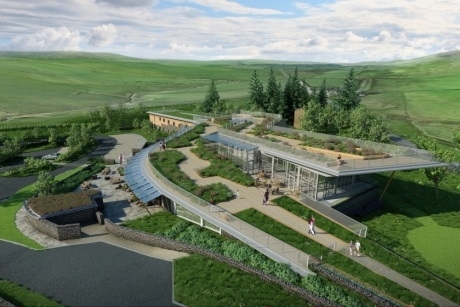 Located close to the Sycamore Gap and the Roman site at Vindolanda, the design of the Youth Hostel and National Landscape Discovery Centre has been inspired by The Great Whin Sill, a nearby geological feature. The building complements and reflects the landscape with dry stone walls, glass and timber. It also boasts an accessible Whin Sill grassland roof with a viewing platform. Various packages are available with YHA, for both Primary and Secondary school groups. Packages include a History, Multi-Activity, Geography, and Action Adventure Package, among others. YHA also supports Learning Outside the Classroom and has been awarded LOtC awards at many of its sites. Teachers can opt for a guided or self-led residential depending on the requirements and itineraries in mind. The residentials can aid pupils’ development in team-building, Physical Education and plenty of other subjects which can be incorporated into a visit. Special offers and prices are available for school groups and teachers and school travel organisers should keep an eye on the website for benefits. William Howarth, acting chief executive of YHA (England and Wales) commented: “YHA The Sill at Hadrian’s Wall is a world class Youth Hostel that we are delighted to add to our portfolio of unique properties throughout England and Wales. For more information, visit www.yha.org.uk. His Royal Highness The Duke of Edinburgh has handed over his patronage of The Outward Bound Trust after 65 years of service.